Preserving the sincerity to spirituality in her credit! She is the bearer of the "most beautiful eyes"
Shares her name with Goddess Sati and their ties. Wont hesitate to explain it in words in a manner impeccable. But her focus on the love for Shivji never drifts apart. Call her fearless, a natural leader, a born charismatic and a fiery woman. She inspires many women who seek help from her. Minakshi possesses many of these traits in herself. Her moderating traits on India-Forums are commendable that highlight her natural leadership qualities. Another significant trait is her enthusiasm about helping other people. The mammoth knowledge about mythology and her interests in sharing them with her fellow members are well known. She looks forward to new challenges and novel situations in her everyday life. Rather than evading any obstacles, being an Aries she always tends to overcome them and thus is eager to discover new things which carves out the inborn talent of creativity and innovation. She never lacks in optimism just like an Aries woman she fights for the right and supports people who follow the same. Aries women always seek true love. In her case it is true. We can witness her love for Shivji. The love and devotion she has for Lord Shiva is something that speaks a lot about her commitment. Aries are very independent and career oriented people. They are very hardworking and supportive towards their co-workers and friends. They can go to any limit to help others. An attractive feature of Minakshi is her positivity and an innocent aura that exists around her. She is a whirlwind of fun, warm and totally unpredictable and compassionate at heart. As we have promised earlier, here we are with "The mythology ki malika herself". So ladies and gentlemen, please give a warm welcome to Minakshi aka Mina! Haritha (Our in-house Interviewer)- So Mina, Happy Birthday and Welcome IF-ians to this awesome segment 'Yeh Baatein Nayi Purani' ... Our members and guests want to know more about you so hope you would oblige us all. Mina- Of course Haritha. Fire away! Haritha- So when did you begin your journey on India Forums ? Mina- Well it happened like this when one day while searching for the story of LTL (Laagi Tujhse Lagan), I got to know about the existence of IF and over time, I decided that I would join as well. Haritha- And we have seen how slowly you have risen through the ranks from a regular member, to a Coolbie and finally to a Viewbie. Extremely commendable. Haritha- So now, we all know the current hotties of our television world, do you have any favourites ? Mina- Of course *smirks* He is the love of my life, my Mishal Mishal Raheja for you. And of course my other favourites would be Mohit Raina of Devon ke Dev Mahadev fame and the Baadshah of Bollywood, my Raj aka SRK. Haritha- looks like someone has drifted to her own little dream world...But Mina, you have to come back because members are anxiously waiting to know the real life mina, what she likes, what she does apart from moderating IF. Okay guys it's time for your favourite rapid fire round. Are you ready Mina ? Haritha- Your top 5 shows ? Mina- Mahabharat, FIR, Devon Ke Dev Mahadev, Rang Badalti Odhani and Laagi Tujhse Lagan. Haritha- Pani Puri or Vada pav- your favourite chaat item ? Haritha- Roses or Jasmine ? Which flower would win your heart if given on your first date ? Mina- I have always loved the fragrance of jasmine. Haritha- The qualities you will look for in your future husband? Mina- I want someone like Shivji. Someone as handsome as he is and who loves his wife more than himself. Haritha- Aw that's so thoughtful and romantic. And with that we would like to end our rapid fire so that she can go and enjoy her birthday with her loved ones. Once again we wish you a very Happy Birthday Mina. So my dear readers, I hope you enjoyed knowing a little more about your favourite Minapedia *laughs* Till the next time, adios and goodbye! The entire team of Crazy Creatives would like to wish you a very happy birthday. May all you dreams come true and may you prosper in your life. Hope this year brings you loads of happy moments and luck. Happy Birthday Minaxi..many many happy returns of the day..may GOD always bless you..have a wonderful and successful life ahead..enjoy the day with your family and friends.. 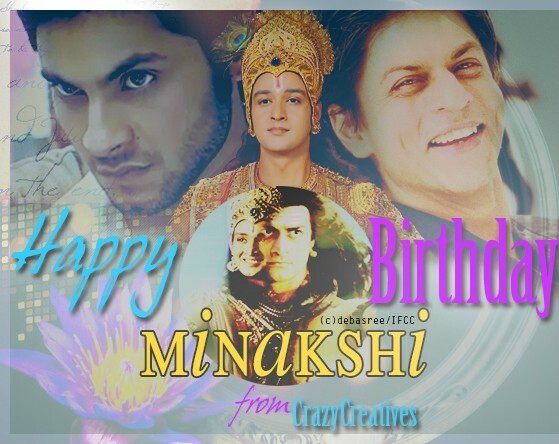 Thanks for always helping me and always listen to me..I know how hard you work as DT to keep peace in the forums..so thanks for that and good luck for the future too..
A very Happy birthday Minakshi. May the good lord fulfil all your wishes and may you success, happiness and prosperity in your life. It has been pleasure to work with you and I really hope that once again get a chance to work with you. You have been always helpful to every member and that's the quality I like about you. Have a blissful life and enjoy the day to the fullest.